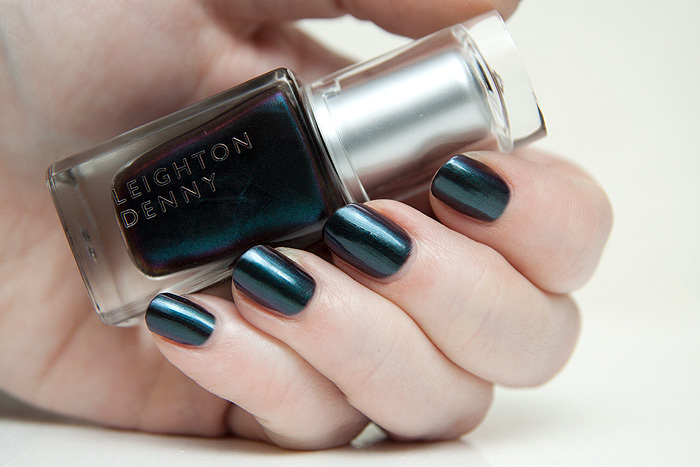 Let’s kick off the week with another nail polish swatch, again from Leighton Denny‘s new Atmospheric Collection. Your Planet or Mine? is a beetle’s wing duochrome that displays mostly teal with flashes of vivid purple around the edges. It scores extra points for providing such good coverage after two coats. Duochromes are notoriously sheer and after a single coat, I thought this one was heading in the same direction. Thankfully, the second topping pulled it all together and I was done. If you love this kind of colour-shifting gorgeousness, you might also want to check out: Ciate Starlet and SpaRitual Health, Wealth and Happiness – both of which, provide similar effects but with enough differences between all three to warrant purchases. Enabler? Moi? Thats such a gorgeous colour! Really loving duochromes at the minute, picked up a really gorgeous one from Topshop, forgotten what it was called though! This is really pretty, will be seeking this out. This looks amazing against your pale skin! Oh gosh, that is just divine. Do want! What a lovely colour and finish. Yep – really like that !! Love the color! Simply perfection! Thanks for the post! Oh god, dilemma! Wanting a load of Zoya Mirrors but now want the Atmosheric, gah! Oh man, do you know of anyplace that has swatches of the entire new collection? This is so expensive to get in the states but it looks AMAZING. Must. Haz. Beautiful effect & teal colour!